Do you want to play in a student orchestra at a high level, perform in the most beautiful concert halls and join our annual tour abroad? Are you available to rehearse on Wednesday evenings? 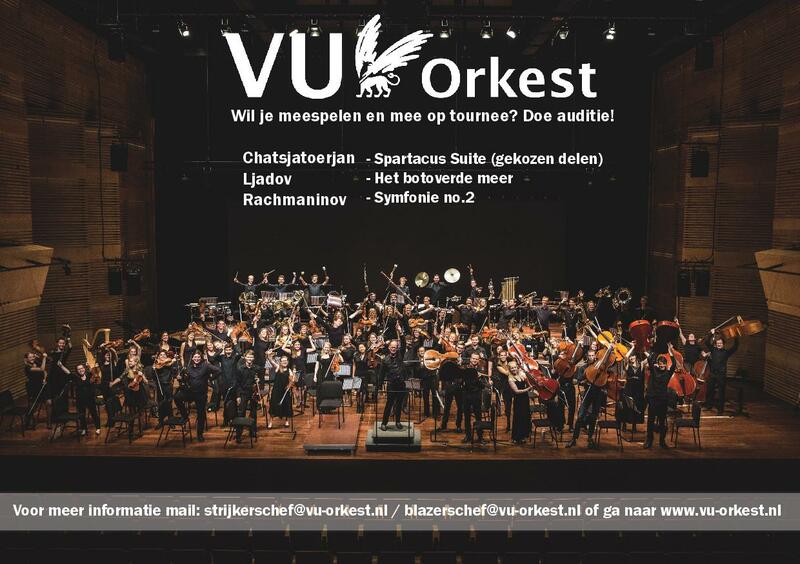 Sign up for the second audition round on the 15th of March and join the VU-Orchestra! We are still looking for flute, bassoon, clarinet, trumpet, bass trombone and all string players. We are also looking for a principle double bass player. Do you play a string instrument and would you like to play double bass in an orchestra? Then you might be able to join the bass class of the VU-Orchestra! Send an email to strijkerschef@vu-orkest.nl for more information about the bass class. The auditions will take place on the 15th of March. It is possible to sign up for these auditions until the 11th of March. When you sign up for the auditions, via the form bellow, you will receive more information.